Catholic Charities of St. Louis has been selected as one of five Catholic Charities agencies nationwide to pilot a five-year, multi-million dollar initiative aimed at reducing chronic homelessness by 20%; decreasing hospital readmission rates for this population by at least 25%; and connecting 35% of newly housed persons with primary care and behavioral health services. The Healthy Housing Initiative, announced today by Catholic Charities USA (CCUSA), will also launch in Detroit, Michigan; Las Vegas, Nevada; Portland, Oregon; and Spokane, Washington. 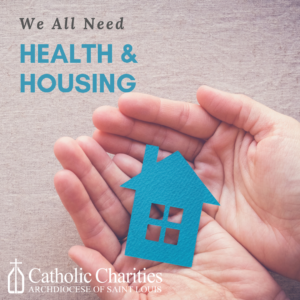 As the local Healthy Housing Initiative lead, Catholic Charities of St. Louis (CCSTL) will collaborate with St. Patrick Center and other CCSTL federated agencies, as well as the Archdiocese of St. Louis, Incarnate Word Foundation, Mercy, and SSM Health. As an agency focused on providing opportunities to those who are homeless or at risk of homelessness, St. Patrick Center will play a major part in the five-year program. The Most Reverend Robert J. Carlson, Archbishop of St. Louis, sees the Healthy Housing Initiative as another opportunity to bring vital healthcare to those currently doing without. “Access to good healthcare is a basic requirement for all of us that the Archdiocese of St. Louis is passionate about,” said Archbishop Robert J. Carlson. See Feb. 11, 2019 press release. ← Go to Bat for Kids 2019: The Tradition Continues!